Several tricks on a self-lit table to AMAZE THE MOST DEMANDING AUDIENCES. Customized performances IDEAL for ALL EVENTS. The newest original idea by "The Lord Of The Bubbles". Short FIRE BUBBLE ACT created by "ZYRKO 2018". "WOW!!" EFFECT. NEWEST ORIGINAL ACT, PERFECT for T.V. 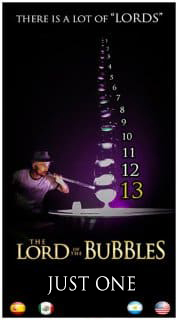 SHOWS, created by Javier Urbina "The Lord Of The Bubbles" where MAGIC plays an important role. Dynamic bubble routine performed only with the hands. A beautiful act that can be customized, IDEAL for T.V. SHOWS and ALL EVENTS. IMPRESSIVE act. Another WOW!! EFFECT that consist in BUBBLES FLOATING ON AIR. IDEAL for cabarets, huge and 360º venues. Probably one of the most difficult bubble acts to execute due to its technical complexity. VERY ELEGANT BUBBLE PERFORMANCE. Another original idea created by "The Lord Of The Bubbles" on this exclusive FIRE BUBBLE ACT finishing with a MAGIC and beautiful touch. "Hat trick" bubble act IDEAL for TV SHOWS, ALL EVENTS and ALL KIND OF VENUES. 3 delicate and refined tricks in a single act. Javier Urbina "The Lord of the Bubbles" is the one and only bubble artist worldwide capable of creating bubble towers as big as this one. An EXTRAORDINARY and complex performance that fuses soap bubbles with a spectacular end with FIRE. WOW!! EFFECT. Colorful bubbles, which can be customized according to the needs of each production. IDEAL for cabarets, huge and 360º venues. UNBELIEVABLE trick on a self-lit table to AMAZE THE MOST DEMANDING AUDIENCES. Magical and very visual. WOW!! EFFECT. Watch how these soap bubbles move to the rhythm of this Waltz. Beautiful short act extracted from the main show. IDEAL for ALL EVENTS. Dynamic performance of BIG SOAP BUBBLES in a circus style, cheerful and spectacular. IDEAL for cabarets, huge and 360º venues. Audiences of ALL AGES can also be protagonists of acts with soap bubbles. IDEAL for THEATERS, TV SHOWS or ALL KIND OF BUBBLE EVENTS. If there is something that fascinates the little ones, it is to be INTRODUCED IN A GIANT SOAP BUBBLE. IDEAL for ALL EVENTS.